[dropcap]P[/dropcap]icture your Monday morning. You drag yourself out of bed, question whether you really need this university degree (as per routine), and grudgingly prepare for your day. If you’re like most SFU students, you rush out your door to catch the bus or SkyTrain for your morning commute. And, more often than not, you run right into a friend or classmate. SFU is notorious for its commuter culture. Going to a university where the majority of students disperse after class as they must endure a significant transit journey to and from school each day really puts a damper on organized social gatherings. Put another way: rainy 6 a.m. bus rides and standing for an hour on the SkyTrain have not helped defend our university against claims of being ‘anti-social’ and ‘depressing.’ But I have to disagree wholeheartedly. Firstly, I admit that SFU’s culture of commuting is incredibly convenient for me. Living independently is currently out of my financial capacity, and if I had attended a different post-secondary institution that wasn’t so keen on commuting, I’d be the sad, lone student commuting by my lonesome, day in and day out. Instead, at SFU, I find myself surrounded with peers in the same situation. The common question then becomes not “what dorm do you live in?” but rather “what bus do you take down the mountain?” And in the year that I’ve been asking and answering that question, I’ve gotten to know a lot more people through commuting together than sitting in lecture. At first I’d inwardly groan or dread the upcoming awkward encounter when running into a casual acquaintance on the bus with whom I’d only really ever exchanged a few words in lecture. However, the multiple meaningful friendships that have arisen out of those seemingly tedious morning encounters have since made me a more social and cheerful member of the student body in the wee hours of the morning. Morning commutes spent relaying your nonsensical dreams whilst still bleary-eyed turn into a morning coffee run, then a morning sprint to the math class for which you are now officially late. An evening train ride home as you discuss the hilarity or tedious quality of your day effortlessly results in a sushi dinner with friends. For me, transit has only served to enhance, not quell, the unpredictability of university life, and truly emphasizes the notion that meaningful and enjoyable experiences can really be found anywhere. And even if you’re left taking transit alone on a cold and dreary Thursday evening, a solitary, forced break in your day is not necessarily a bad thing. I had one friend remark that he finds his bus rides peaceful: they give him time to just look out the window and think. Another friend of mine swears that, if it weren’t for the hour break from school that transit forces her to take, she’d never be able to read fiction anymore, a hobby she greatly enjoys. Our commuter culture, though it may brand us antisocial, is just that: a part of our culture. For me, it’s become a part of attending SFU, a routine in my day. Some days I find myself cursing my wretched fate as I shiver while waiting at the upper bus loop for the 145, but most days I genuinely appreciate the time I get to chat with unlikely friends I never would have bumped into otherwise. 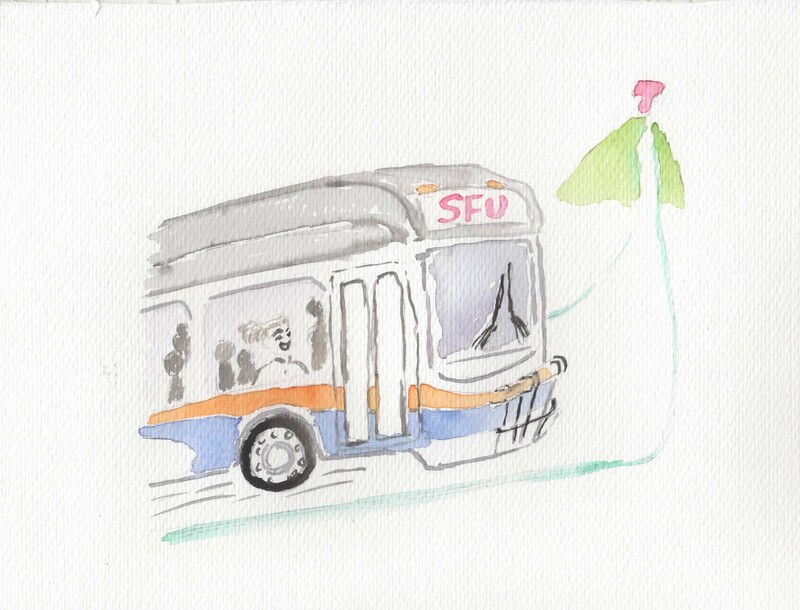 For better or worse, our commuter culture is just another aspect that sets SFU apart from other universities, and something that will always be inextricably linked to my time here.